Known as the Mother of Mercy in the East, Kuan Yin has been worshipped by Buddhists for thousands of years. She is the greatest of bodhisattvas and embodies the totality of compassion for humanity. This 33 minute rosary meditation is a devotion to the Mother of the East and as a way to bring East and West together. Follow in the footsteps of Kuan Yin as you join in this rosary of love and forgiveness and let this light flow through you to emanate blessings and compassion to all. This rosary of contemplative prayer was designed to help devotees of Kuan Yin to become one with her compassionate and merciful heart. 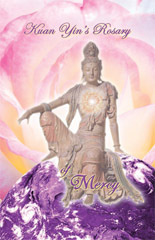 Kuan Yin Shares Teachings on Maintaining a Merciful Heart amidst Duality. Avalokitesvara's release of Light was delivered through David Christopher Lewis messenger for the Ascended Masters. Kuan Yin known as the Mother of Mercy in the East, has been worshipped by Buddhists for thousands of years. She is the greatest of Bodhisattvas and embodies the totality of compassion for humanity. She removes obstacles, erases past offenses, dispenses mercy, healing and spiritual graces, while always meeting the true inner needs of the soul. Her shortened Chinese name, Kuan Yin, means “Hearer of Sounds.” Her full name, Kuan Shih Yin, means “Hearer of the World’s Sounds.” According to Eastern tradition, when Kuan Yin was about to enter heaven, as she stood on the very threshold, she could hear the cries of humanity. She did not enter but returned to help all who suffer in the earth plane. The term “Hearer of Sounds" can also be translated as “perceiver” or “regarder” of the world’s sounds. She is known in much of Asia as a divine emanation that answers the prayers of those who faithfully call upon her name. Kuan Yin removes obstacles, erases past offenses, dispenses mercy, healing and spiritual graces, while always meeting the true inner needs of the soul. One of her many titles is Bodhisattva of Compassion. Bodhisattva is a Sanskrit word—bodhi meaning "enlightenment" and sattva translated as "reality" or "existence." A bodhisattva is an enlightened being who has vowed to forgo higher realms and full liberation in order to assist those still struggling in the physical world. A bodhisattva cultivates virtue and pursues his/her spiritual career while on a path of self-sacrifice for the welfare of others and gives compassionate, loving service to humanity and to all sentient life. A bodhisattva (P’u Sa in Chinese) can be a person still in embodiment or a celestial being like Kuan Yin. At this highest transcendent level, the title is mahasattva. Kuan Yin is a cross-cultural, nondenominational figure revered by many spiritual and religious traditions around the world. She serves the aspirants of all spiritual heritages and paths.Those who espouse a concept of an impersonal, formless divinity see her as an expression of the essence of compassion, or as a symbol of it. Others who acknowledge a personal Godhead view her as a divine embodiment of this virtue. Some view her as both the impersonal and personal manifestations of divine compassion, with no contradiction. 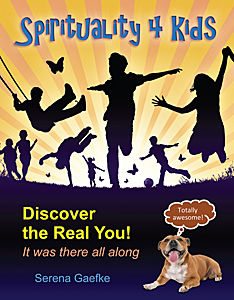 She nurtures the growth of this quality in us through our devotions and our interpersonal relationships with others. 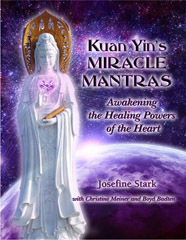 —Excerpted from Kuan Yin's Miracle Mantras by Josephine Stark. HeartStreams prepare us to be co-creators with divinity in order to experience soul and planetary freedom, and they contain keys to our ascension. Find both audio and transcribed versions of HeartStreams in this regularly updated database by using the interface below. Search by a variety of means, including a text search similar to that which most database engines allow. Follow in the footsteps of Kuan Yin as you join in this rosary of love and forgiveness and let this light flow through you to emanate blessings and benevolence to all. 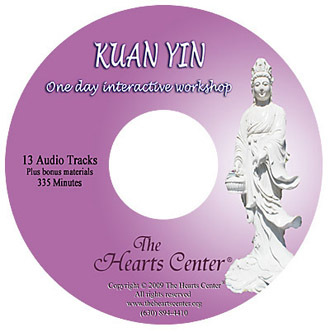 A fascinating explanation of Kuan Yin including famous embodiments, legends, sutra promises, descriptions of her retreat, the secrets of sound and the violet light. 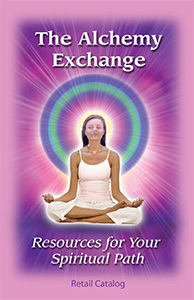 Over 70 pages of mantras with pronunciations and illustrations for hand mudras with additional visualizations and meditations!